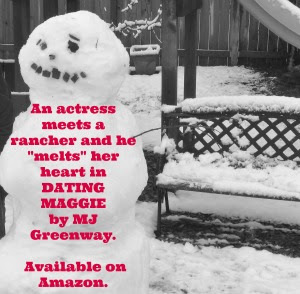 There's still time to enter to win an e-book of DATING MAGGIE at Apryl Baker's Blog! In other news...I've recently discovered Picmonkey. They make it easy to edit photos or make logos or graphics. I'm a writer with no graphic design experience. I learned about this site from a group of fellow Limitless writers. I made my logo at the top of this page. I also used a photo I took of a snowman to create a winter book teaser. Sure, I still need to practice but it's fun learning something new. And I apologize for inserting a shirtless cowboy in this winter scene...like I said...still learning. Now if only I could find a Star Wars tie in for DATING MAGGIE promo I'd be set. Maybe I should show up at the long lines where folks are "camping out" and hand out paperbacks. I'm just spit-balling here:) I hope you all get a chance to build your own snowman sometime during or after the holidays!